On July 4, 1954, Mercedes-Benz returned to Grand Prix racing for the first time since the war with a stunning one-two victory in the French GP at Reims. 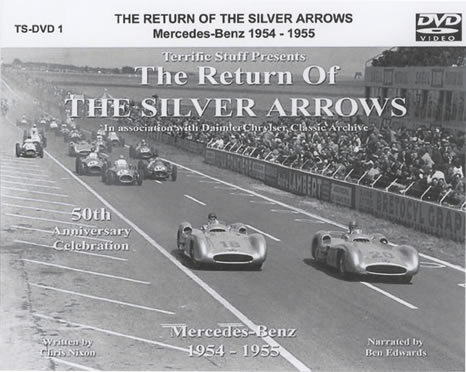 To celebrate the 50th anniversary of that historic occasion, Terrific Stuff presents this film from the DaimlerChrysler Archiv (and others), which records the Silver Arrows’ racing programme of 1954 and 1955. Led by 1951 World Champion Juan Manuel Fangio, they won five of their seven races in 1954. The following year Mercedes went sportscar racing too; the W196 GP cars were joined by the 300SLRs and Fangio was joined by Stirling Moss. The year was blighted first by the death of Fangio’s greatest rival, Alberto Ascari, and then by the tragedy at Le Mans, when more than 80 people died. Many races were cancelled as a result, but those that were not were all won by Mercedes-Benz. At the end of the year the company withdrew from competition, and the Silver Arrows were confined to the Mercedes-Benz Museum.